“Mom! I’m famous!” That’s how 4th grader Caelen Ough responded when he saw himself online as The Shadow Project’s first Reading Star! Caelen and his mom Kedma kicked off our Reading Stars initiative, which celebrates the reading progress of Shadow kids. (You may remember Caelen raised money to buy an IPad for his special education classroom last year.) Parents, we invite you to send a photo or short video of your child or your family reading together to shadow@shadow-project.org and we’ll post it our Facebook page. Parents can interview their child or simply have them describe a favorite book, character, or a triumph in reading progress. The Shadow Project: Why do you like this book, and can you tell us a little about your favorite character? I would pretend to be Spongebob Squarepants because he is funny and one of my favorite shows. I would pretend be Phineas from Phineas and Ferb because he and Ferb make really awesome inventions. Finally I would pretend to be Hiro from Big Hero 6 because I would have a personal robot to take care of me. TSP: Those are some great characters! What do you love most about reading? CO: What I love most about reading is that some books make me laugh, like Captain Underpants. TSP: What’s the hardest thing about reading? CO: Reading isn’t hard for me just writing. TSP: Do you have a favorite place to read? CO: My favorite place to read is at the Duniway Library. At home, it’s upstairs in my room. TSP: Do you have anything you want to share with other children? 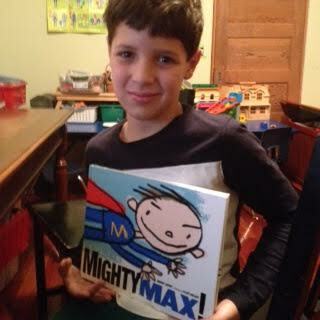 CO: If there is a kid out there that wants to read Mighty Max I would tell them it’s a funny book. TSP: And finally, can you tell us a little bit about yourself and what you want to be when you grow up? CO: My name is Caelen Ough. I am nine years old. I go to Duniway School. I am in the 4th grade and when I grow I want to be a technologist or an engineer. Keep up the good work, Caelen! and most importantly, keep reading! P.S. Contact us at shadow@shadow-project.org for more information or to submit your own Reading Star.